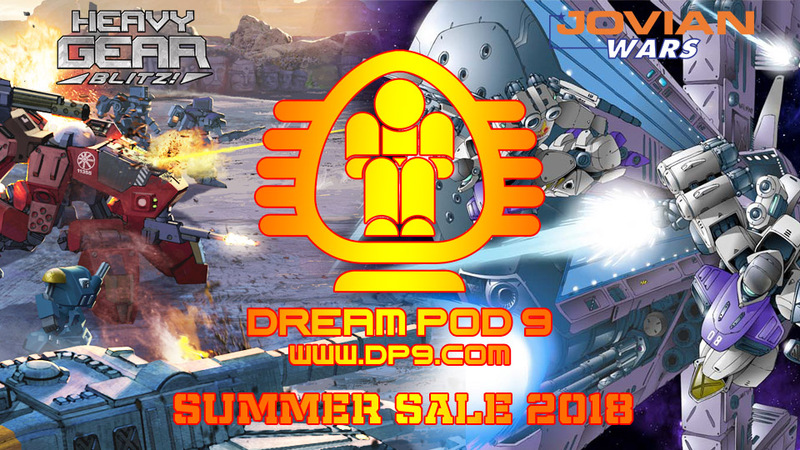 Dream Pod 9: Dream Pod 9 Summer Sale 2018 is Now On! Dream Pod 9’s annual Online Store Summer Sale for 2018 is now on and will run until the end of August 2018. We have sale specials on Heavy Gear Blitz and Jovian Wars starters and faction armies, plus great Bonus Gifts you can choose for larger orders. Just starting out with Heavy Gear Blitz Tabletop Wargame pick up our Two Player Starter Box which includes Northern plastic miniatures and Southern plastic miniatures armies (total of 30 minis) and a copy of the full color HGB Quick Start Rulebook (normally $89.99 USD SRP, sale price $84.99 USD). Or maybe a Northern, Southern, C.E.F., or Caprice plastic miniatures army box (normally $59.99 USD SRP each, sale price $54.99 USD each). And our printed full color Heavy Gear Blitz Quick Start Rulebook (normally $19.99 USD SRP, sale price $14.99 USD). Plus our resin Striders are on special with at least 10% off their SRP. Striders include the Scimitar, Mammoth, and Thunderhammer for the North. The Drake, Naga (walker mode), Naga (roller mode), Sagittarius, Dragon, and Hydra for the South. The Cataphract, Redbull, Coyote (walker mode), and Coyote (tank mode) for Peace River. The Hussar (walker mode) and Hussar (tank mode) for NuCoal. And for our C.E.F. players we have all the resin Hovertanks on special, including the massive HHT-90, HT-68, HT-72, LHT-67, and LHT-71 models. And for our Caprice players we have the resin Moab Mount on special. If you need a little bit to get your order to the next Bonus Gift level, remember that we have individual weapon parts for sale as well. If your up for Space Battles, checkout our Jovian Wars Tabletop Wargame and pickup a CEGA Faction Starter Force (normally $107.95 USD SRP, sale price $102.99 USD) or a Jovian Faction Starter Force (normally $107.95 USD SRP, sale price $102.99 USD). And if you need a little bit to get your order to the next Bonus Gift level, remember that we have lots more Spaceships, weapons, and parts for sale to upgrade the ships. Wonder what you can get at the lowest Bonus Gifts level, a $7 USD gift could be used to select one of our HGB or JW Faction Decal packs for ($6.99 USD value), terrain bases, or a couple of weapon parts. Higher levels could be used to get Single Pack Blisters, Two Pack Blisters, or some of our Badlands Terrain Buildings to make your own gaming table. 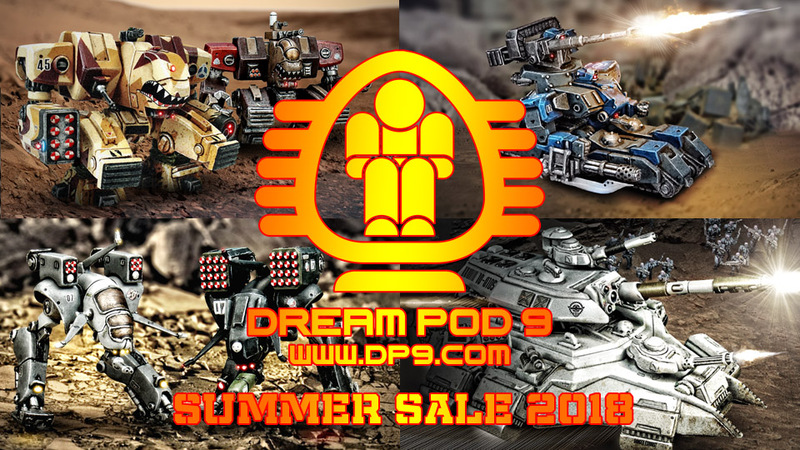 Home › Blogs › Robert Dubois's blog › Dream Pod 9 Summer Sale 2018 is Now On!